Will the rise of machines result in our becoming slaves? What is the human consciousness? Science fiction fans whose typical Hollywood diet of future killer robots may not have considered the very real possibility that, when quantum computing gives rise to artificial intelligence, its rate of technological advancement will not only become exponential, but it will apprehend quickly (and scarily to us) who we are, and who IT is, especially if this A.I. has instant access to all human knowledge. 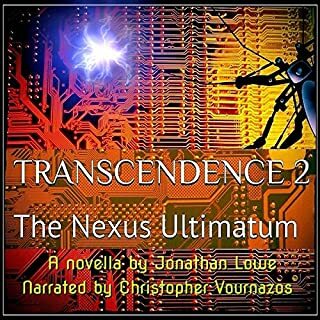 What made the experience of listening to Transcendence 2 the most enjoyable? Lowe manages to pack in the social, the political, and the personal in a single, hour-long story about a government-related computer project gone rogue (literally, the computer gone rogue). His wryly humorous protagonist seems the most grounded of them all--or perhaps the mostly deeply in denial--about the future being shaped for the planet by the Nexus system. Lowe wisely leaves the story with room for interpretation--and further development. I for one would enjoy hearing this story either retold from multiple perspectives or with additional subplots/characters, creating a series of short stories or in essence a full-length novel from this novella.